http://www.trainsarefun.com/lirr/odds_e ... c.1950.jpg Photos are 1950's. Wayne Martin, Islip High Class '68 wrote this... Very nicely fits the first photo! Here's some more. The last one's a killer ! in today's rail jargon they would not be called double deckers as there is no second floor/deck. I can't recall the exact count, but at some point in the mid-60's a good number of the double deckers were modernized. Improvements included new HVAC, windows, lighting and interiors. I believe that 1305 was one of these updated cars. My recollection is that they were pretty sharp. I know of one car that was fully rebuilt with new air conditioning and M-1 upholstery seats, painted platinum mist (silver gray) with a blue stripe. This was in anticipation of keeping them after the first order of Budd M-1's arrived. The rebuilding cost was astronomical, and the Railroad used the cost to successfully lobby for funding the second order of (GE-built) M-1's. That was the end of the double deckers. Other double deckers may have been rebuilt, but not the the level of this one. Only one was painted silver. Of course, there were three different classes of the double deck cars. The prototype (#200, built in 1932) and one were shorter than the rest and were built before WWII. After the lapse during wartime, Alcoa built the remainder of them which were longer than the original two. The cars were entirely constructed of aluminum and electrolysis with some steel rivets posed some problems with the prototype cars. The photos above show subtle interior differences in the classes. Coach cleaners hated the cars, and swept the lower compartment garbage under the steps. Trainmen disliked them because of the bending and reaching up and down to service tickets. Guys could sit in the lower levels and peek under women's dresses. Guys liked that. 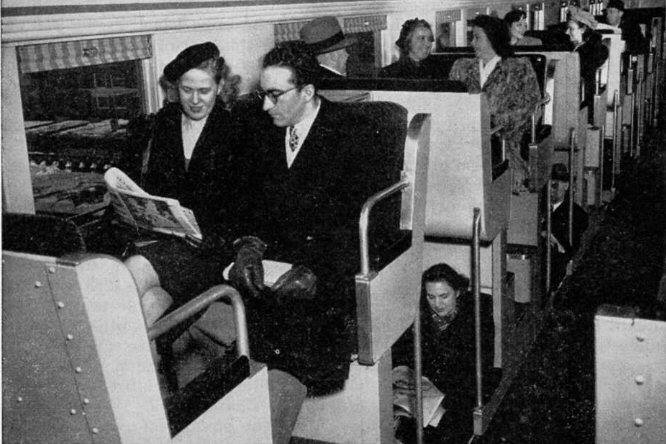 The Railroad later adopted 3/2 seating which gave a conventional coach the equivalent seating in subsequent 1950's Wyer and 1960's Zip car orders. It seems like seating capacity would be lost in this arrangement, no? Kelly&Kelly wrote: The rebuilding cost was astronomical, and the Railroad used the cost to successfully lobby for funding the second order of (GE-built) M-1's. That was the end of the double deckers. The option order of M-1s was intended to replace the MP72/75s and convert them into diesel coaches. Good stuff folks, thank you! Kelly&Kelly wrote: I know of one car that was fully rebuilt with new air conditioning and M-1 upholstery seats, painted platinum mist (silver gray) with a blue stripe. This was in anticipation of keeping them after the first order of Budd M-1's arrived. 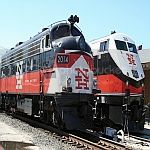 The rebuilding cost was astronomical, and the Railroad used the cost to successfully lobby for funding the second order of (GE-built) M-1's. That was the end of the double deckers. Other double deckers may have been rebuilt, but not the the level of this one. Only one was painted silver. That was the 1346. I wondered what the interior looked like, and the ones with the orange stripe & tinted windows, like the 1305. Nice photos! If my memory's correct, the one rebuilt in platinum mist and blue had MTA seating, with upholstery in the same fabric as the M-1's with M-1 seat bolsters and Formica wallboard with the NYS seal. It also had new air conditioning and some new stainless interior trim. The ones that were "refurbished" earlier simply were repainted and had new vinyl floor tiles and tinted window glazing to replace the shades. If they knew they were looking to get rid of these MUS why rebuilt them? The crews hated he MP70s or so I was told by some of those who worked them. The single double decker that was rebuilt was a demonstration of how the car could be upgraded if the fleet was to be retained. It may have actually been done to disprove the feasibility of keeping them, because the cost was so high. I don't know for sure what was the actual intent.